New York: Hampton Press, 2011, 262 pp. (incl. index), £28.95, ISBN: 978-1612890470. © Mariona Rosell Llorens 2013. “Information Society” (IS) is a widely used concept nowadays, it could be identified with a shift in the framework of production (information-based) and with a shift in social communication (more immediate and globalised), however, the actual concept is not clearly defined yet, and the term can be used and understood from a number of different perspectives. In his book, Alan McKenna seeks to encourage governments to commit to a more inclusive concept of the IS involving the adoption of a new human right to participate in the IS, which would engage citizenry in a more effective way. As McKenna highlights at the beginning and end of his book, the IS has generally been defined and considered from an economic and technological point of view. Such an approach, he argues, envisages technological developments as evolving independently from society thereby requiring society to adapt to them. The technological discourse heralded by governments through their policies becomes self-fulfilling and, paradoxically, undermines the role of politics in social evolution with regard to the IS. Consequently, a notable risk of social exclusion is illuminated, reflected in what is already known as the “technological gap” or “digital divide” between those who can regularly use the Information and Communications Technologies (ICTs) and the ones who cannot. This gap is accepted and tolerated, because it is regarded as being inevitable from a market-based perspective of the IS. Considering the gatekeeping power of corporations, such exclusion not only jeopardises access to the IS, but also the ability to participate in generating information. Given these factors, McKenna argues that governments’ policies in relation to the IS are in need of reform. As a result, he advocates for the construction of a new human right which would ensure “a definitive standard of inclusiveness beyond the mere reliance on markets” (p. 2). Human rights evolution and new rights creation. The definition of the IS. What “effective” participation in the IS entails. Reasons for the creation of a human right to participate in the IS. The role of politics in generating new human rights; in this case, the importance of a ‘human rights policy’ within policies related to IS. These themes are tackled over the course of eight chapters. Chapter one provides an introduction; it defines the scope and aims of the book. Chapters two, three and four focus, respectively, on the human rights feature, the Information Society concept and citizen participation. In chapters five, six, and seven, McKenna develops his argument for this new human right by presenting three exemplifying cases. In these chapters he examines the EU’s visions of the IS; the right to communicate; and the discussions about IS concept at the World Summit on the Information Society, respectively. Chapter eight provides concluding remarks. The work opens with an introduction that outlines the aims of the book, its structure and the contents of each chapter. McKenna’s arguments commence with the assumption that human rights are social constructions which, therefore, mean they are non-static in nature. The author argues that since humankind is constantly evolving (and so too are its values or commonly shared standards of coexistence), new human rights have to be discussed and adapted to such evolution, otherwise, problematic situations of exclusion and increasing inequalities may occur. In chapter two, McKenna offers a reflection on the evolution of the human rights doctrine and argues in favour of an analytical model for new rights creation. McKenna identifies some problems concerning human rights discourse which have to be taken into account when advocating for the creation of a new right. A first hurdle is that human rights discourse is chiefly comprised of three different discourses: philosophical, political, and legal. A second hurdle is that there is a risk of excessive utilisation of the human rights approach. And third, in order to preserve a coherent framework, new human rights ought to be rooted in pre-existing rights. In addition to these, there is also the problem of achieving sufficient political consensus to define and accept a new human right. Chapter three analyses the concept of the IS and its lack of a universal definition. The author argues that to in order to design a new human right, it is crucial to understand how the IS is defined, especially with regard to its enforceable limits. In brief, the IS is generally understood as the “society based upon the use of Information” (p. 43), but McKenna notes that pursuing a comprehensive meaning of “information” in different contexts is problematic. Different transformations relating to information are taking place, and serious epistemological obstacles have to be faced to achieve an objective understanding of them and of the term “Information Society”. 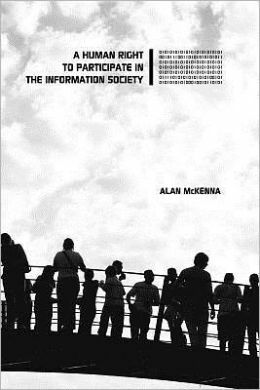 McKenna uses Frank Webster’s five-plus-one definitions of the “Information Society” as a basis to clarify the extent to which information is becoming a central issue in social life and, at the same time, the differing conceptions of it. These definitions are: the technological, the economic, the occupational, the spatial, the cultural and the theoretical knowledge-based. The author also introduces explanatory theories of this new era of the IS, those emphasising discontinuity –D. Bell and M. Castells’ perspectives, for example; and others arguing for continuity such as H. Schiller, J. Habermas and A. Giddens’ perspectives. Chapter four focuses on the idea of participation and, more precisely, on “effective” participation. The features of the participation principle used by the United Nations Educational, Scientific and Cultural Organisation (UNESCO) are taken into account; Participation has to be inclusive, (i.e. referring to every citizen), and participation has to be meaningful. Following on from this, inclusive participation in the “Information Society” should mean: Access to information and communication networks and access to decision-making processes. Moreover, highlighted throughout the book is the need for citizens to be able to shape what the IS is and what it entails. The author calls for a deeper engagement in what participation should involve in order for it to be meaningful participation. To fully understand both the need for “effective participation” in the context of the IS, and the need for this new Human Right, McKenna also addresses the communicative nature of humankind. Communication should be understood as having as much importance as information in this new society based on the use and trade of information. Alongside other arguments contained in this work, the author seeks to put forward the idea of the importance of communication as an essential feature of society and the linkages between participation and communication’s in this context. To regard participation as being necessarily part and parcel of communication is quite understandable because, in order to be part of society and to be able to contribute in it, “communication” has to be fully guaranteed. This means that in order to guarantee effective participation; first, we have to be aware of the appropriate communication channels –currently focused in the ICTs; second, we need to master our communication skills –by knowing how to use ICTs; and, finally, we have to be able to actually use them. Chapters five, six and seven introduce three different exemplifying cases that support the claim for the need for a new human right to participate in IS. The first case is the European Union (EU) policy towards the IS phenomenon; the analysis serves to illustrate how the EU treats the “Information Society” as an actual fact, although it has never been formally defined. The EU considers it to be an important issue to incorporate into the Union’s policies –see for instance E-Commerce Directive. The second case is the development of the right to communicate which, despite the failure of its development, serves as an example of how political power can determine human rights discussions. The third case described is the discussions at the World Summit on the Information Society which provides evidence of growing concerns in relation to this new era in which we live and its implications. Despite the disparity of agendas among the actors involved, which makes it difficult to measure the success of this summit, the event highlighted the continuing development of the IS concept through dialogue. Chapter eight provides an overview of the author’s reasons for advocating for a new human right. In order to reinforce the arguments put forward throughout the book, the perspective taken here takes a slight shift. It treats the human rights feature as a means to achieve a much more inclusive conception of the IS; it argues for enhancing participation in IS policies through a human rights’ approach. The author suggests that in order to prevent exclusion from the IS, there is a need to include a human rights agenda within it. The role of politics is crucial for that; politics ought to engage with a human rights discourse when addressing the issue of IS. Additionally, however, McKenna also refers to a number of outstanding conceptual problems that would need further reflection; one is the debate between a single IS and a plurality of local information societies; another concern is whether this new right has to be defined as an individual right or, as he suggests, as a group right. In sum, McKenna’s work aims to give reasons for a more participative understanding of the IS and for policies that develop it accordingly. The current conception of the IS defined solely on the basis of technological and economic factors, is potentially harmful not only for citizens with no access to ICTs, but also for citizens with access to them but who themselves are not powerful enough to shape and contribute to the IS. That is precisely why the new human right to participate in the IS as proposed should be understood as having a double dimension. On the one hand there is the ability to communicate within the IS, what I understand as a “tangible” dimension, which would consist of granting the technical mechanisms for participation. Whilst on the other hand the right would also provide citizens with the ability to participate in shaping the IS. The second dimension, refers to what I understand as an “intangible” dimension, which would consist of working towards a more effective inclusion in the IS for citizens through the adoption of appropriate education programs, and by ensuring the protection of citizens from any abuses of service providers and guaranteeing the freedom of speech. This author agrees with Alan McKenna’s suggestions. Despite not being able to clearly define the “Information Society”, by recognising that for all societies, information and communication are integral, we can acknowledge that the phenomenon exists. We are experiencing an increasing dependency on ICTs for normal life, which may put citizens in a potentially dangerous situation if left to markets and corporations to govern. The perspective presented in this work poses challenges to many national and international policies; however, McKenna’s viewpoint is significant in order to truly comply with the democratic principle. In other words, the right for every citizen to take part in the IS has to be enacted and enforced because we are now, and will be in the future, much more dependent on ICTs to effectively communicate, socialise and participate in public life. Without access to the IS, equality between citizens would be jeopardised. In short, we are experiencing not only a quantitative but a qualitative change in living with information, something that should compel us to engage in a deeper reflection on the IS within the framework of human rights. Fundación Caja Madrid PG Scholarship 2011.